The IYGU closing ceremony will be held on Nov 21, 2017 from 1 to 5pm at the Aula of the Friedrich Schiller University Jena. Please download the invitation flyer here. The ceremony will be preceded by a press conference at 12:00pm in the Senatssaal (in the same building) and will be followed by a reception in front of the Aula. The World Humanities Conference, which is organized by CIPSH, is kicking off soon! Check out the conference homepage and the preliminary program. The program is being continually updated, so make sure to check back regularly. There will be two dedicated IYGU sessions and many more events organized by people from the IYGU network and Global Action Center for the Arts. On August 7, Margalit Berriet from the IYGU Global Action Center for the Arts will be participating in a discussion panel on Aug 7, 2:30-4pm on the role of the arts for human flourishing. Margalit will be speaking on how the arts help to bring individuals, societies, and the world together. Make sure to check out the Arts and Society session organized by Margalit Berriet and her team on August 8, 6:30-8pm to get a glimpse of the many wonderful art projects from around the world that were submitted to the Arts and Society project. There is also an APHELEIA session on August 9 from 9-10:30am in which Luiz Oosterbeek, Inguelore Scheunemann, Renaldas Gudauskas (all from the IYGU network) and many others will be discussing “The Humanities in Environmental Management – Cultural Integrated Landscape Management”. And finally, check out the two IYGU sessions on August 9. The first one titled ‘The Program of the IYGU as a Lever for Sustainability’ runs from 2:30-4pm and features Benno Werlen, Vladimir Kolossov (IYGU Steering Committee), Armin Reller (IYGU Scientific Panel), and Karl Donert (IYGU Outreach Panel). The second session on Aug 9 runs from 6:30-8pm and is titled ‘Reflecting and Reviewing IYGU’. It will take the format of a roundtable discussion. It would be wonderful to see you in Liège! IYGU partner APHELEIA has published a booklet with poems read by students at the poetry night during the 2017 APHELEIA intensive course held from March 28 to April 8, 2017, in Mação, Portugal. The booklet was edited by the students and contains poems in various languages plus their English translations. Check it out by clicking here. The regional radio station MDR Kultur broadcasted an interview with Benno Werlen (in German; length: 40:11min) on May 27, 2017. Check it out by clicking here. The IYGU Global Action Center for the Arts hosted by Mémoire de l’Avenir (MDA) together with the IYGU, UNESCO-MOST, and the International Council for Philosophy and Human Sciences (CIPSH) are happy to announce the opening of the Arts and Society Platform. The people at MDA are working hard to add more and more projects over the next weeks so check back regularly to see the latest additions. You can also show your support for MDA and their amazing work by voting for them to increase their chances of winning €10,000 in the “construisons-un-monde-meilleur” competition. If successful, MDA would use the money to support the Arts and Society project. The jury had a very hard time selecting the winning entries from all the creative and technologically advanced contest submissions. Many more Story Maps than those presented here would deserve mentioning. However, we had to limit it to the most outstanding ones in each of the two age groups: (A) high school students aged 15 to 19 and (B) college/university students aged 19 to 30. There was an equal number of votes for two submissions competing for the second place in the group of college/university students, hence there are two students who will be receiving the second price. While there was a large number of submissions overall, only very few of them came from high school students so that only the first two ranks in this group have a name attached to them. Congratulations to the winning submissions and a big thank you to all those who submitted their wonderful maps! ESRI has put together a website with a collection of the winning IYGU Story Maps: Meet the winners here! Click here to read about the so-called ‘effort instrument’ developed by five Thuringian companies (including the IYGU partner JENA-GEOS® Ingenieurbüro GmbH) as well as the Nordhausen University of Applied Sciences. This instrument is intended to comprehensively address social and environmental issues that arise in the course of an energy transition in neighborhoods and communities. It adopts an interdisciplinary and holistic approach and provides a method for planning energy-efficient neighborhoods by including aspects such as urban planning, historical preservation, and ecological affairs. With a foreword by Benno Werlen. Click here to read a statement by AAG President Glen MacDonald and the governing Council of the American Association of Geographers (AAG), or visit the AAG website for these and other AAG news. Click here to read about the most important events, updates, and developments for the IYGU! Working, Housing: Urbanising and Communicating, Networking: Interacting are now online! Two of the IYGU Open Access Springer books, Working, Housing: Urbanizing (eds) Allen Scott, Peter Taylor and Jennifer Robinson and Communicating, Networking: Interacting (ed) Margaret Robertson can now be downloaded as open access books or purchased as a soft cover printed version. Click here to read about the recent updates from the German Regional Action Center in Lueneburg. 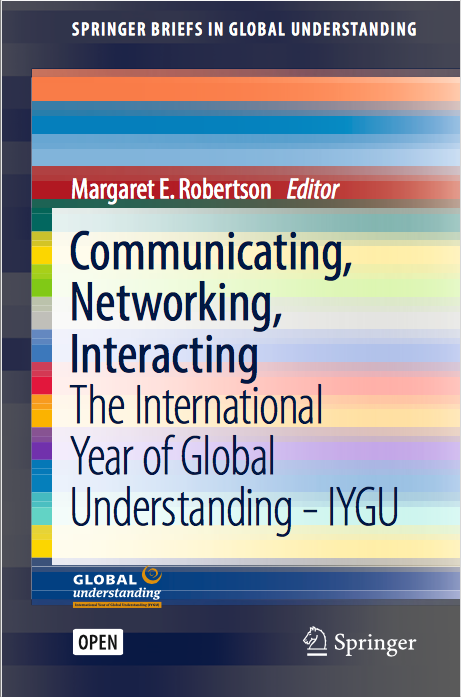 Click here read about the most important events, updates, and developments for the IYGU!